The beautiful silver table in Her Majesty's collection at Windsor Castle, illustrated on page 68, is probably one of Spanish make of late sixteenth or early seventeenth century. Although not strictly within the period treated of in this chapter, it is convenient to observe that much later, in the seventeenth and eighteenth centuries, one finds the Spanish cabinet maker ornamenting his productions with an inlay of ivory let into tortoiseshell, representing episodes in the history of Don Quichotte, and the National pastime of bull-fighting. These cabinets generally have simple rectangular outlines with numerous drawers, the fronts of which are decorated in the manner described, and where the stands are original they are formed of turned legs of ebony or stained wood. 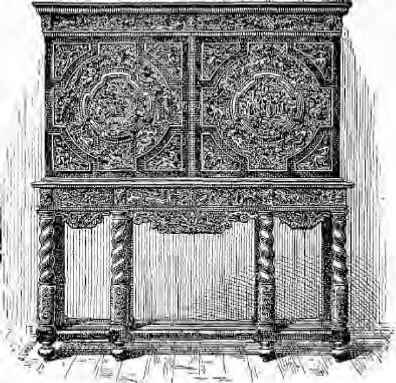 In many Spanish cabinets the influence of Saracenic art is very dominant; these have generally a plain exterior, the front is hinged as a fall-down flap, and discloses a decorative effect which reminds one of some of the Alhambra work—quaint arches inlaid with ivory, of a somewhat bizarre coloring of blue and vermilion—altogether a rather barbarous but rich and effective treatment. 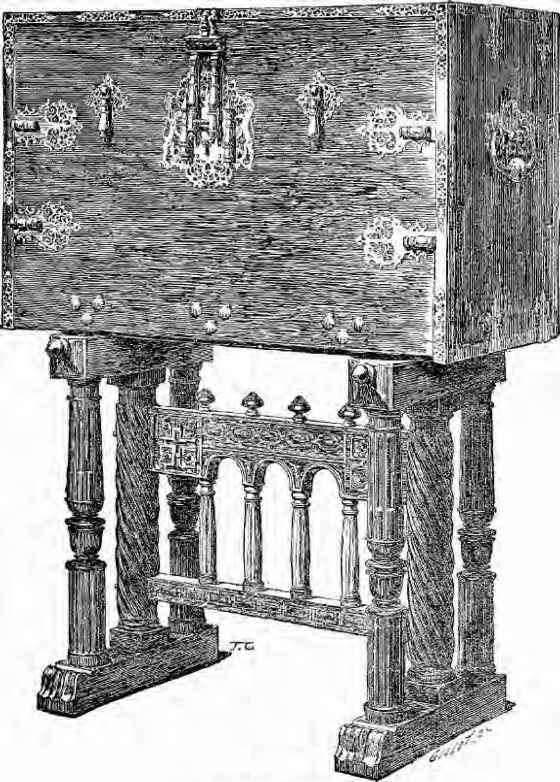 To the seventeenth century also belong the high-backed Spanish and Portuguese chairs, of dark brown leather, stamped with numerous figures, birds and floral scrolls, studded with brass nails and ornaments, while the legs and arms are alone visible as woodwork; they are made of chesnut, with some leafwork or scroll carving. There is a good representative woodcut of one of these chairs. Until Baron Davillier wrote his work on Spanish art, very little was known of the different peculiarities by which we can now distinguish examples of woodwork and furniture of that country from many Italian or Flemish contemporary productions. Some of the Museum specimens will assist the reader to mark some characteristics, and it may be observed generally that in the treatment of figure subjects in the carved work, the attitudes are somewhat strained, and, as has been stated, the outlines of the cabinets are without any special feature. Besides the Spanish chesnut (noyer), which is singularly lustrous and was much used, one also finds cedar, cypress wood and pine.